Vibrant colors in our crepe paper back masking tape will help differentiate your tasks and products. 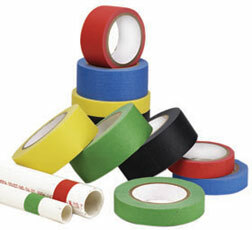 Our masking tape is available in 6 different colors: White, Black, Green, Red, Blue and Yellow. Colored masking tape is designed for color coding and identification of just about anything.